We all needed to know road signs to qualify for our driver’s license but these days, correctly recognising safety signs could be a matter of life and death. Striving to transcend the need for language, the graphics used are internationally recognised symbols. Of course, there are some safety signs that require the use of words too, but they would usually not be of primary severity. Let’s have look at the various sign categories out there. The regulating bodies have set up three primary severity classifications for safety signs. Biological hazard signage is in a category of its own. Biohazards refer to biological substances that pose a threat to the health of living organisms, primarily that of humans. This can include samples of a microorganism, virus or toxin (from a biological source) and warnings are required regarding hazardous materials, equipment, containers and rooms, where there may be exposure risk. Provide information regarding machines, building area or equipment. Notice signs are to be used in cases for outlining procedures, maintenance information, instructions, rules and directions (not related to personal injuries). For broad safety-related information, usually related to health, medical equipment, sanitation, first -aid, housekeeping and suchlike general safety measures. These are alert signs that should explain the dangers and the consequences associated with entering a restricted area. Particularly for labelling fire-fighting equipment and for all fire exits. These communicate general facility information that may be required for safety, such as finding the way, or for restrooms but never to convey hazards or risks. With safety signs being mandatory, negligence is inexcusable. 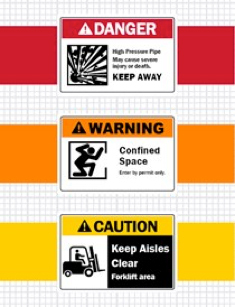 Signage companies are equipped with all you need to create safety signs. They know the standard colours, font styles and sizes needed as well as the colours required and being standard, stock is not an issue.